In previous posts I’ve covered the many sides of acne prevention from a natural, pharmaceutical-free perspective, including the foods you need to avoid, the supplements that will help, and exactly why I never recommend the birth control pill as an acne treatment. But in this post I want to talk about the right skincare routine and products for women suffering with hormonal acne. I used to be a woman suffering with acne – as you know, I had terrible, painful cystic acne all over my face, chest and back as the result of my PCOS and hormonal imbalances. I’ve tried everything. 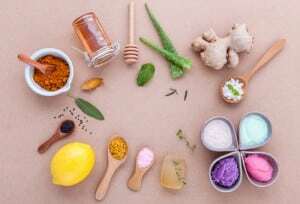 And while I know that preventing acne is a task that must go more than skin-deep – you have to address your diet and lifestyle habits too – I also now know the absolute best products that prevent acne. These products are also hormone-safe, of course. Your skin is your largest eliminative organ, so you have to be very picky and choosy about what you put on it. Whatever goes on your skin, seeps into your pores and your bloodstream. You skin needs to function at its optimal level to help you eliminate excess hormones and other toxins too, and the right skincare products will support that. If you would like more information on the root causes of hormonal acne and adult acne as well as extra support from me on how to prevent acne based on specifics like your age, where on your face or body acne appears, and when you get the most acne, listen to my “Get Gorgeous Skin – Clear Acne Naturally” webinar. Topical, rapid treatment – use a product that contains sulfur, but won’t dry out the area, if you have lumps, bumps, cystic acne, or a zit emergency! The Naturopathica’s Moss Treatment Mask can be used as a monthly mask or just dab a small amount on the acne area and leave overnight. Sulfur, is also found in veggies like kale, and is safe for your skin and safe for your hormones. Everyday facial wash – a gentle moisturizing scrub is the way to go, and it’s much better for you than benzoyl peroxide-based cleansers that go straight through your liver and add to your body’s toxic load. Alba Botanica’s Daily Detox Cleanser is a great choice. Moisturizer – dry, parched skin is actually more prone to acne than well-moisturized skin, which is why moisture zapping products like Proactiv don’t work for long, if at all. I use 100% pure, organic Aloe Vera gel (which is also anti-inflammatory) – Desert Essence has a hormone-safe product. If you live in a very dry climate or have naturally dryer skin then pick a heavier moisturizer that’s super creamy and calendula-based like Naturopathica’s Calendula Hydrating Cream. Face mask – fruit acids used during the luteal phase can help with skin renewal and regeneration. I use the Naturopathica’s Pumpkin Enzyme mask in my pre-menstrual phase to support my skin during that commonly acne-prone time. Sunscreen – most of us are not outside in direct suns much of the time and we need that sunshine for essential vitamin D absorption, which is vital for our hormonal health and fertility. I use a zinc-based, physical block sunscreen on my face if I’m at the beach or on a day hike and will be out in the sunshine for a long time. Because of the endocrine disruptive chemicals in regular sunscreens, I prefer to rely on a UV-protective sunhat, sunglasses, and a mineral pressed powder that contains zinc oxide on my vulnerable areas – my nose and chin (like those products made by Jane Iredale) if I’m just out and about on a normal day in New York City. Scalp treatment – if you experience acne, it’s very likely you also have dandruff issues. For this I recommend using regular baking soda on your scalp when your hair is wet, before you shampoo. Scrub baking soda into the scalp, then rinse with water, then shampoo your hair, and then rinse again with Apple Cider Vinegar. Other than that, a gentle, everyday shampoo that is aloe vera based is great – try Shikai Everyday. You can also use the essential oil Neem on your scalp, which is full of moisturizing fatty acids and very soothing. Finally, try a deep scalp treatment once a month with antimicrobial and antifungal, organic coconut oil. First, do you have hair loss or an overgrowth of hair? Second, do you have acne? there is an excellent skin care –Eminence Organic . They have a probiotic skin care specifically for acne prone skin. Love it. Which makeup brands are hormone-safe, for those of us with PCOS or other imbalances? Imbalance that can be corrected with overgrowth of body hair? Had bad cystic acne in my mid twenties, nearly 10 years ago. Now I have great skin. I have fibroids but they do not affect my ability to get pregnant or have a regular period. The excess hair is embarrassing. Any suggestions on how to reduce it? Yes, it can be due to high testosterone. A diet and lifestyle approach to support balanced hormones could help! I’ve found Aveeno, which is oats based, great for my dry skin. I now want to look into the ingredients I’m using more. Hi Alisa and Flo team! Do you have any good suggestions for people with verrrry sensitive skin and autoimmune issues? Some of the natural stuff has caused me to break out because of some plant allergies and some clogged pores due to oils like ozonated olive oil (formerly recommended by a functional medicine doctor) that clog me up. A dermatologist put me on antibiotics, retin A, and Cerave/Cetaphil to clear it up–and it’s working. But I’m worried about undoing the remission of my autoimmune thyroid illness and clogging up my liver. I’m having trouble finding a natural alternative to Cerave and Cetaphil. My dermatologist was dismissive about my concerns about endocrine inhibitors and parabens–saying that she uses Cerave and Cetaphil herself and on her baby. Are there any non synthetic products you recommend for very sensitive people in your practice? Thank you!!!! If this is TMI I’m sorry but here goes…..I’m 46 in peri-pause and have suffered from acne episodes since I was 15. It seems every decade I have had flare ups with the exception of my 20’s which were my most beautiful skin years. (Following Accutane) The early years consisted of antibiotics and Retin-A. I’ve cut back almost completely on gluten and sweets and have increased my vegetable consumption. I don’t drink sodas. I have tried several supplements, acupuncture, and nothing seems to work. I did purchase your program a couple of years ago but I never did schedule an appointment. I really don’t know why. There are no words to describe how I feel. I work full time and am in nursing school. Stress has become a way of life. I would love to buy wrinkle cream instead of acne cream but wrinkles are not my concern. This bout of acne has been very persistent. It doesn’t matter what time of the month it is, I have at least two or three cysts mainly around my nose, mouth, or chin. I’m way too old for this problem. I have the Woman Code book on my Kindle. If you have any suggestions I would be very appreciative. Which phase is best to use the coconut oil scalp treatment? Thank you for all of your help and resources. I bought your book and have been trying to implement the advice. For years I have cut “fats” from my diet (which was super “healthy”/organic/clean). I don’t have a period and have been suffering from terrible cystic acne for years. I was also over exercising and a little underweight. I’ve stopped exercising and reincorporated “healthy fats” into my diet again. I’m trying to up my calories to gain weight. How long do you think it will take to start seeing results? Should I take antibiotics to jumpstart the process? My acne is really painful. I would not recommend taking antibiotics to deal with the acne – it may help your skin as long as your on it, but it will have repercussions for gut and overall health. It will likely take some time for your body to replenish enough to get a period – I would recommend getting some basic blood work to check iron. Vit D, Vit B and other blood work. Focus on digestion to get the most out of everything you eat. If you want a more guided approach and support to heal your hormones, we do have an online protocol that would be perfect for you! Let us know if I or my team can help. The link to the Jane Ireland products doesn’t work anymore. Which products did you recommend? I’m confused, I’ve read that aloe is a progesterone blocker and will mess with you if you have to take progesterone even temporarily. I just started using elina organics but have been told by a progesterone dr that I can’t use it if I want the temporary hormones to work ( bioidentical progesterone onlynfor 3 mo) I had used progesterone before for 3 mo and it caused bloating and hair loss. He says it’s the xenoestogens not the progesterone and that I have to eliminate them all. I used to have pcos and now have pmdd at 38. I don’t eat gluten or dairy but am still estrogen donminant: I’ve been trying to follow your book but am not sure about the skincare protocall. He’s calling for me to remove foods even like celery that promote any estrogen at all. I just finished your 4 day detox again. Any suggestions?